There is nothing special about this simple banana walnut cinnamon cake. This cake is as ordinary as your everyday white loaf bread. I can't find anything that I could shout out loud. There is absolutely no wow factor, be it the texture, the flavour...and it certainly doesn't look like a pretty cake. In fact, the method of preparing this cake is not very different from baking a batch of muffins. It is just like putting 12 muffins together to form a cake. Yet, I couldn't help but to blog about it, and that is despite the colour of my photos came out weird, thanks to the poor lighting condition. This is the kind of cake that I will make anytime, as long as I have a bunch of over ripe bananas and leftover walnuts, or any nuts or dried fruits I could find in my fridge. Making the cake is a breeze, you do not have to invest much of your precious time just to put a cake into the oven. It is one of those cakes that you could bake on a whim...jumping from the couch to the kitchen ;) There is not much washing up either. Best of all, it is quite a fool-proof recipe...I doubt anything could go wrong, unless this is the very very first time you have ever baked a batch of muffins. Even then, by following the steps closely, I am sure any novice will be able to make a stir-and-bake cake like this one. Despite its simplicity, the texture of the cake is really good....soft, moist and fluffy. Definitely a healthier choice than any store bought banana walnut cake as it doesn't leave a greasy after taste, or stick to the roof of your mouth...yet it doesn't taste dry at all. I wouldn't recommend omitting the cinnamon powder as it does lend a aromatic flavour to this ordinary, everyday tea cake. Toast chopped walnuts at 150degC for about 8 to 10mins, stir in between and make sure walnuts do not get burnt. Line base of a 7" round pan with removable base with parchment paper, grease (with butter) and flour the sides. Set aside. Sieve together cake flour, ground cinnamon, baking powder, baking soda and salt, set aside. Place eggs, caster sugar, oil and vanilla extract in a mixing bowl. With a manual whisk, whisk to combine. Add mashed banana, whisk to combine. Sieve over the flour mixture, with a spatula, fold the mixture until just incorporated. Do not over mix. The batter should appear lumpy. Add in chopped walnuts (set aside 1 tablespoon to use as toppings), stir just to combine. Pour batter into prepared pan. Tap the pan a few times on work surface to release any trapped air bubbles. Sprinkle the top with the remaining walnuts. Bake in pre-heated oven at 175degC for 30-35mins or until a tooth pick inserted into the centre comes out clean. Remove from oven, leave to cool for 5mins. Unmould and transfer to wire rack, let cool completely. Hi HHB, thanks for sharing so much on preparing the baking pan, this part to me is worst than preparing the cake batter. I welcome this idea of baking all muffins in 1 pan. I'll do that next time. Sometimes simplicity is best. I think this cake looks quite lovely and I am sure it is a very good cake. Bananas, walnuts and cinnamon is a flavorsome combination. By the way, do you roast the walnuts first or does it go in raw ? Kimmy, glad to hear that you have picked up some tips here! Phong Hong, thanks for asking, I have forgotten about toasting the walnuts, yes, I usually toast nuts before using. I have just updated the instructions, thanks! Hi Anonymous, yes, you can use plain flour instead. Hi there, checking if you have an email as I couldn't find it around here. My email is DanielFoodDiary@gmail.com Thanks! 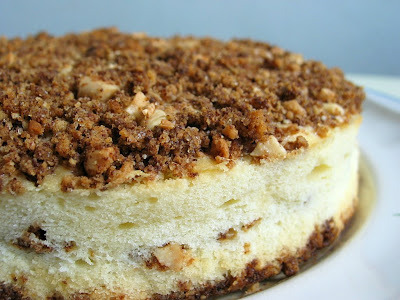 This post of yours make me crave for a slice of really nice banana cake now! Can't wait to see more recipe updates from you. Cheers and greetings from Malaysia! and thank you so much for nominating me for the Versatile Blog Award!! Hi HHB, my pleasure. I enjoy reading your blog from time to time and you simply deserve it. :-) Have a good weekend with your loved ones! HHB, I baked this all in one muffin today with my new loose base round pan. Turns out well, soft and moist. Thanks for sharing. Okay, if I post this recipe in my blog to share with others, too? Hi Kimmy, glad to hear that you cake turns out well :) Yes, you may post it on your blog, but would appreciate it if you could link it back to this post. May I ask what sort of banana did you use for this cake? And the walnuts are readily available in bakery supplies shop like Phoon Huat? In the supermarket bakery section, there is only this Red Ribbon brand ... is that good enough? Would love to give this a try!!! Thank you! Hi Ee, I used delmonte bananas, you can get walnuts from Phoon Huat. Hope this helps. Hi, your cake looks delicious.. Your walnut is raw? By the way, if the walnut is sprinkle on top of the cake do we still need to toast it? Can we just sprinkle raw walnut and bake together? What will be the differ in taste? Will the walnut get burnt? Hi, yes, I used only raw walnuts. If the walnuts are used as toppings and baked together it is not necessary to toast it especially the walnuts are fresh (newly bought). The walnuts may get burnt if the top of the cake is too near the heating elements. You may cover with foil if the top starts to brown too quickly but the baking time is still not up. Toasted walnuts will definitely taste better.